Indianapolis, Ind.-based Felony is another band from the late ’80s that never broke through past the local club scene for various reasons but luckily their music has been preserved by Eonian Records with this compilation of various recording sessions from 1989-1993. With downright evil looking cover art, I was hoping this wouldn’t be another fluffy glam metal band and they’re not, especially once getting past the first four tracks (which were the band’s first recorded offerings). While the band never gets into full-blown heavy metal, later tracks are heavier, meaner due to a changing band line-up and I even hear a bit of alternative metal in some of these songs (Lords seems to be channeling Layne Staley a bit on “Days of Disease”). For the first four tracks, there’s a strong Motley Crue influence. 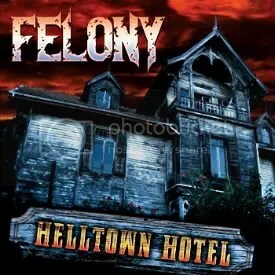 “Heist in Helltown” sounds like it could be a lost early Motley song and Tommy Lee Lords vocals are similar to Vince Neil with these songs as well. One gripe I have is the inclusion of three different versions of “Heist in Helltown”. Seems a bit excessive, but then again, then band probably doesn’t have a whole lot of recorded material in the first place. This isn’t a great album, but it is still a fun ride that shows Felony had some real talent at writing songs and were getting better at it as time went on. Would’ve been really cool if the band was able to soldier on in through the lifeless alternative-infested 1990s. I’m still waiting for the day The Police, Warrant, Sheriff, Sentenced and Felony all share a bill together.